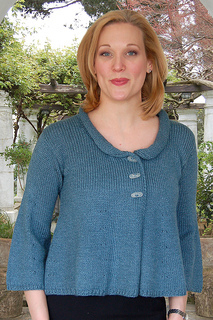 Swing into a little knitting action and create this charming jacket! Shaped from the top down, it is cropped and has a generous flare that is flattering to all body types. The rolled collar is worked in reverse stocking stitch, imparting a little raised definition. The three-quarter length sleeves are knitted on circular needles from the shoulder downward with a shaping that complements the jacket body. Knit in a worsted weight yarn, this is a project that moves along briskly - in order to be ready for just about year-round wear.